I’m changing things up a little tonight. 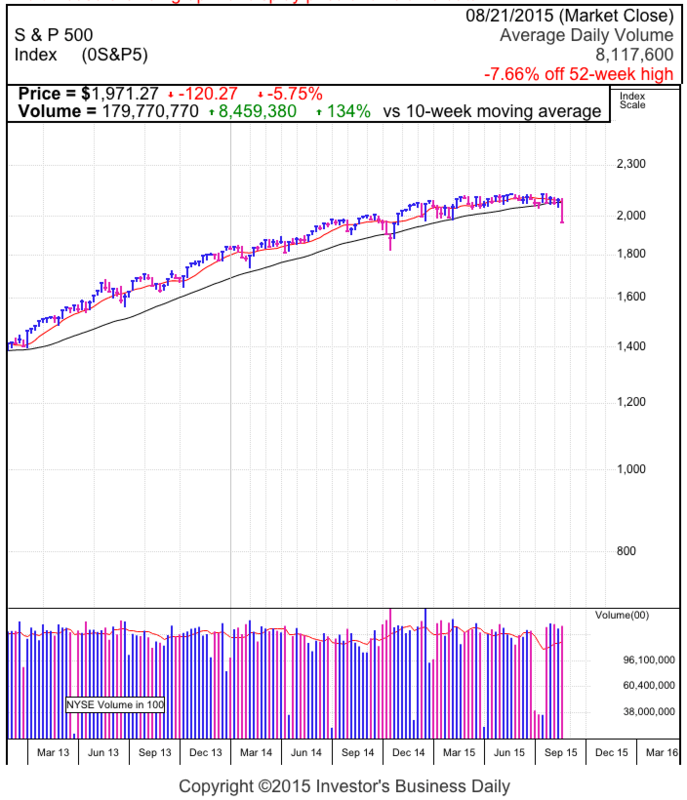 Normally I write about the daily fluctuations in the stock market, but given the dramatic and emotional moves in recent days, a bigger picture analysis is warranted. This blog post is for all the nervous owners out there that are not sure how to respond to these uncertain times. As I write this, overnight stock futures are plunging nearly two-percent because of continued Asian weakness. No doubt this will carryover to our shores Tuesday morning and compel many owners to sell their stocks at even greater discounts. Their rationale is to sell now before things get worse. But as investors and traders, the first questions we should ask ourselves is if we want to buy stocks when they are cheap or expensive? The natural follow-up is if we want to sell when they are cheap or expensive? While the answers are obvious, this isn’t consistent with the way most people trade. Many owners are desperately selling their stock right now because they want to get out before things get worse. “What if this is another 2008?” they are asking themselves. Surely we all want to avoid that type of disaster again. Not so fast, some of the best buys I made over the last 20-years were in 2008. Not as a trader, but as an investor. I rarely write about the buy-and-hold portion of my portfolio because there really isn’t much to talk about. Every month I add to my long-term investments and then forget about them. Through thick and thin, they just sit there. Sometimes they go up in value, other times they go down. But every month I keep adding to them because I believe in the US economy and that our stock market is the best place to grow my money until I need it 20 or 40 years from now. While we only recently climbed out of the “lost decade” where our market was flat from 2000 to 2013, those were actually fantastic years for the long-term investor who dollar-cost-averaged into the market over that entire period. When everyone was selling and reducing their 401k contributions because of the dotcom bubble and financial crisis, I kept buying more. Those buys in 2002, 2003, 2008, and 2009 have more than doubled. All my buys in 2004, 2005, 2010, and 2011 are up in the high double digits. While the stock market had a “lost decade”, my buy-and-hold account had a phenomenal decade because I continued buying when other people were selling. Think about that tomorrow as you contemplate selling your stock or decreasing your 401k contributions because of this Asian uncertainty. Personally I’d love to see another 2008 because that would be another fantastic buying opportunity for the buy-and-hold portion of my portfolio. If you enjoyed this post and found its content valuable, share it and retweet it. If you want to to be notified when new content is published, sign up for free alerts. Where Did the Dip Buyers Go? It was another dramatic day in the market as the S&P500 gave up a healthy 2% rebound to end the day solidly in the red. Volume was elevated, but well off of Monday’s historic levels. The market opened sharply higher on the coat-tails of an impressive European relief rally. But our rebound never built momentum and traded sideways under 1,950 for the first half of the day. While it was nice to see the emotion fueled selling take a break, the lack of further progress revealed those with cash were not ready to buy the dip. Without demand to extend the rebound, we started sliding lower midday. The selling picked up speed as fear of regret compelled many to dump their stock at any price. This became a self-fulfilling prophecy that accelerated until we closed near Monday’s lows. Those that thought they could hold the dip lost their nerve and bailed out this afternoon. While this close looks atrocious technically, it is actually laying the foundation for the inevitable rebound. Weak and fearful owners were selling shares to far more confident dip-buyers willing to hold this volatility. While people try to outsmart the market with fundamental and technical analysis, it trades on nothing more than supply and demand. Once we exhaust the supply of fearful sellers and replace them with confident owners, prices will stop falling regardless of what the headlines and gurus claim it should do. The hottest topic in the financial press is if the Fed will raise interest rates in September. Many claim there is no way the Fed can raise rates when the stock market is struggling. My question to these people is what changed since the last Fed meeting? Has employment gone up? Has GDP gone down? Outside of the chronically weak energy market, have we seen deflation flare up? I cannot think of anything that materially changed in the U.S. economy since the Fed’s last meeting. The only thing that is different is the Chinese stock market’s bubble that burst, but is this Chinese gambler’s paradise really something our Fed should be making policy decisions on? Which of the following two scenarios scares you more? A) The Fed raised interest rates 0.25% today because they are confident the U.S. economy no longer needs artificial support. B) The Fed chose to keep rates near 0% today because they believe the economy is too fragile to withstand a modest bump in rates at this time. I don’t know about you but I would be far more fearful if the Fed doesn’t raise interest rates than if they do. And I suspect this will also be the market’s reaction. Expect prices to rally on a modest and sensible rate hike, and fall if the Fed thinks the economy is too weak to withstand a rate hike. But Fed decision is weeks away and most of you want to know how to trade this market on Wednesday. The most bullish thing this market can do is sell off sharply Wednesday morning and then bounce into the green Wednesday afternoon. That would mark a capitulation bottom. A less compelling bottom would be continuing to consolidate between 1,850 and 1,950. While the consolidation would be volatile and choppy, this is the easier bounce to jump on board because the recovery will be far slower than the capitulation’s vee-bottom. And lastly and most bearish would be another relentless slide that closes on the lows of the day. That tells us there is still further downside and this might not stop until we hit bear market territory. Were you in cash when the market collapsed? What is it worth to you to receive this analysis, insight, and my personal trades every day during market hours when there is still time to act on it? Start your free CrackedMarket Premium trial today. 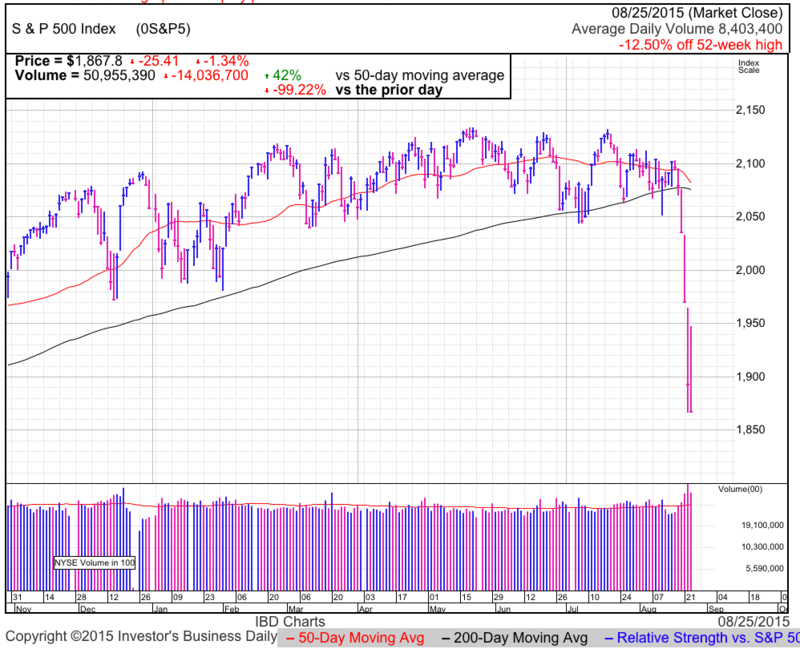 The S&P500 officially entered correction territory Monday as the index closed down more than 11% from recent highs. Trading volume surged to one of the highest levels in history. It’s hard to put today’s move in context since so few times have we seen such a volatile day where prices jumped multiple percentage points every hour. Clearly this is one of the most emotionally charged markets this decade. The question before us is if these dramatic moves are warranted based on severely deteriorating fundamentals, or if this is simply an overreaction and the buying opportunity of the year. The first thing we need to understand is what kind of selloff this is. Selloffs take one of two forms, the insidious grind lower that slips under the radar because few are alerted by slow moving declines. The other is the breathtaking plunge that makes front page headlines around the world. I don’t think anyone needs me to tell them which type we find ourselves in the middle of. But here’s the thing, the selloffs we fear the most are typically the ones we don’t need to worry about. Sharp moves lower are often followed by sharp rebounds. Last October’s 10% Ebola plunge bounced back within two-weeks. Five-years ago we recovered from 2011’s 20% U.S. Debt downgrade within six-months. While everyone remembers 1987 for the largest single-day selloff in market history, few remember that we actually finished 1987 up 2%. The most similar selloff to our current situation was the 1998 Asian financial crisis that saw us tank over 20%. But you know what, we were making new highs within five-months. The selloffs we really need to worry about are the slow grinds lower. While most people remember the financial crisis that consumed our markets in October 2008, the market actually topped a year earlier in October 2007. One of the largest selloffs in market history started in the Fall of 2007 when no one was paying attention. While this recent plunge shoved us down nearly 250-points across five trading sessions, in 2007 it took us four months to fall 250-points! The lesson from history is we should fear the selloffs that few pay attention to, not the one the world is fixated on. People are free to disagree with me because “this time is different”, but they’re arguing against history. To clarify a little confusion that arose from last night’s post. In one breath I said that buy-and-hold investors should stick out this volatility, while in another breath I said I pulled my money out before Friday’s big plunge. Many people were confused by these conflicting statements, so let me clear things up. The difference is timeframe. I’m a reasonably active trader and move in and out of the market one or two times a month. My trading strategy is to take advantage of one, two, and three percentage moves in the index, take my profits and then move on to the next trade. Most savvy active traders would have gotten out of bullish positions last week when the market started moving against them. That is why it is my assumption that anyone still in the market has a longer holding period than I do. If someone makes a couple trades a month, I would suggest they get out of the way of any move lower. But if a person only makes a couple trades a year, holding through dips is part of their game plan. That’s why it is called buy-and-hold, not buy-and-hold-until-you-get-scared. While this move is dramatic, I don’t see a reason for long-term investors to dump their stock at a steep loss. Hold on and in six months or less we’ll be making new highs. As always, keep the comments and questions coming. Last week’s nearly 6% plunge in the S&P500 was the largest weekly decline since 2011. As painful as that was, what should we expect next week? The good news: these selloffs typically only last a few days. The bad news: emotion fueled selling can do an awful lot of damage in just a few days. Unfortunately for many, the days of defensive selling are long gone. The only choice left for someone still in this market is to join the emotional selling, or stick to their original buy-and-hold plan. When stated that way, the right choice is obvious, but sticking to it when everyone around them is running around with their hair on fire is far harder to do. Without a doubt the selling can and will likely continue next week (overnight futures are already down over 1%). The only question is if we should get out ahead of a much larger decline, or if this is simply another buyable dips on the way higher? Of course there is a third option: both of the above! The only reason to abandon this market is if we think we are on the verge of another crippling economic contraction. Something that will freeze our capital markets, crush consumer and business spending, and trigger waves of layoffs and spiking unemployment. Most of last week’s fear revolved around slowing global growth. That means we have to figure out how this will impact our economy. To be perfectly honest, the US economy is extraordinarily self-absorbed. Seventy percent of our GDP is service based and we run a gigantic trade deficit. Does that sound like an economy dependent on global growth? Lower energy and commodity prices, cheaper junk at Walmart; what does that mean for our economy? It means consumers will have more money left to spend on massages, vacations, and bathroom remodels. Should we be worried about our economy? Not really. Obviously the China story will affect companies like AAPL and TSLA that have huge Chinese growth premiums built into their stock price. But these are the exception in the S&P500, not the rule. While the pessimists are concerned about plunging energy sector profits, we know American consumers are lousy savers and without a doubt the dollars saved on energy will find their way into other sectors of the economy. That’s bad for energy shareholders, but it is a net neutral for our economy since one loss is offset by another gain. And lastly, every time the stock market had a “lost decade” over the last 100+ years, we pulled out of it with a ten to twenty year secular bull market. The roaring ’20s, nifty ’50s, and ’80s and ’90s tech boom were brilliant times to own stocks. And all three followed a depressing and demoralizing decade of owner ownership. If history repeats itself, this bull market isn’t even halfway done. I will gladly concede that our economy isn’t very impressive, but where pessimists see weakness, I see opportunity. Protracted bear markets start when economic activity reaches unsustainably high levels. This overshoot results in the inevitable economic contraction and a devastating bear market. At this point in our economic recovery, most bulls and bears will agree our economy has a long way to go before it reaches anything close to overheated levels. That means we are safe from the next major economic contraction. While stock market selloffs happen inside major secular bull markets (1987 occurred in the middle of the greatest bull market in history), corrections in secular bull markets bounce quickly and are great buying opportunities. Keep that in mind when the crowd tries to tempt you into selling your stocks at a steep discount next week. The worst day in four-years capped off the worst week in just as long. It was a brutal, relentless selloff that shoved us down 3% for the day and nearly 6% on the week. Volume exploded to the highest levels in nearly half a year. And if those stats didn’t fully capture the sense of urgency, the VIX saw the biggest weekly percentage gain on record. While I’ve been writing about the pervasive bearishness seen among active investors that contribute to internet forums and answer investor surveys, today’s selloff broke beyond the financial pages and became front page news. People who don’t regularly follow the stock market heard about today’s plunge. That opens the door to an entirely new population of sellers. While it’s been a great ride from the 2009 lows, today’s weakness could give the average 401k investor flashbacks to 2008’s fear and regret. That creates the very real opportunity for this weakness to spiral out of control. But before we get too carried away, we survived sharp selloffs in 2011 and 2014, so we know this storm will pass too. The 2011 selloff was nearly 20% and came on the heels of a S&P downgrade of United States debt. That drop did a lot of damage but we were making new highs within six-months. Last year’s nearly 10% Ebola scare rebounded to higher levels within weeks. Without a doubt this selloff’s recovery will fall somewhere inside this range. Armed with that knowledge, we can decide how to trade this. If we will be back near the highs in less than six-months, would you still be tempted to dump your stocks at a steep discount today? If yes, then sell. If no, then resist the temptation to bail out and stick to your buy-and-hold plan. The worst way to trade the market is buy when it feels safe and sell when it is scary. Remember, risk is a function of heights, meaning this week’s 120-point selloff makes this the safest time to own stocks all year. Think about that for a moment. But don’t expect the rest of the market to think about the situation this rationally. There is a good chance Monday will be another bloodbath as a portion of the 401k crowd tells their financial planners to “sell everything”. Mutual funds settle at the end of the day and a surge of people placing mutual fund sell orders could show up late Monday. But once those people are out, we’ll probably run out of sellers and be poised to bounce on tight supply. The best profit opportunities come from buying other people’s panic and the pickings are really good right now. Keep your head and you’ll come out on top. If you enjoyed this article, sign up for free email alerts and receive notifications when new content is published. 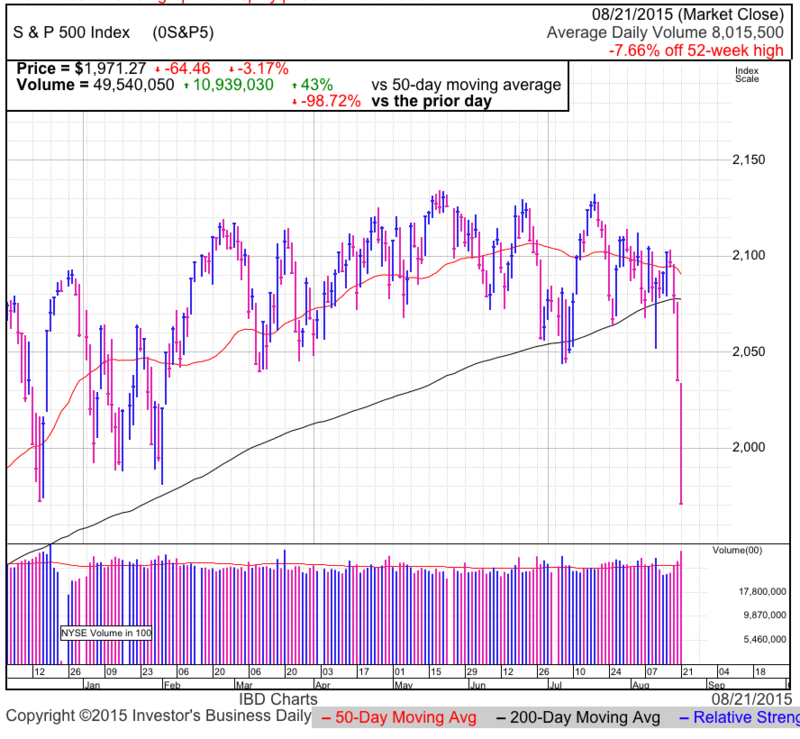 The S&P500 crashed through support on its way to six-month lows. Again volume was surprising light for the biggest down-day in a year-and-a-half. While some are running around with their hair on fire, the lighter volume tells us most owners resisted the temptation to join the emotional selling. There are two ways this can play out. The bullish scenario has confident owners standing strong and the resulting tight supply will put a floor under stocks. The bearish storyline plays out if confident owners lose their nerve in the face of further declines and join the emotional selling. That will lead to a surge in volume and end in more traditional capitulation bottom quite a bit lower from here. As scary as today’s selloff felt, we need to remind ourselves that we are still within 5% of all-time highs. While most of the world has seen double-digit declines, our markets are holding up remarkably well. Either that means we need to catch up to everyone else, or more positively the US markets have become the safe haven for global investors desperately seeking shelter. Between the strong dollar and our resilient market, the US is easily the most attractive place for the world’s wealthy to move their money. This easily explains much of the strength we are seeing in the S&P500. Over the medium-term I remain bullish on our market and still expect we will finish the year in the green. But how we get from here to there is a little less clear. Today’s weakness was a clear sell signal for shorter-term traders. While I’ve been bullish on this market, this morning’s awful price-action told us the bottom wasn’t in yet. We bounce decisively from oversold levels and retesting the lows today signaled there was more selling left. Friday could get even more ugly since nothing shatters confidence like screens filled with red. Long-term buy-and-hold investors need to resist the temptation to bail out. This is one of those periodic market gyrations and when they sell years from now, this weakness will be long forgotten. Shorter-viewed traders need to be more cautious. It is probably getting a tad late to be adding new shorts, but those lucky enough to be short can let this play out a little longer. Just be prepared to lock-in profits because when this bounces, it will be fierce. Those with cash should resist the temptation to jump in too quickly and wait for a little more stability. As for the longs that feel stuck, there is nothing wrong with selling defensively, but don’t let a little volatility sour your attitude toward this market. Be ready to jump back in as soon as the selling exhausts itself, which is only days away. While days like this hurt, the trader in us should be excited because buying discounted shares from emotional sellers is the easiest and fastest way to make money in the market. The S&P500 took us on a wild ride Wednesday, covering nearly 100-points intraday. We’ve seen big moves recently, but today’s volatility takes the cake. As dramatic as the surges and crashes were, volume was barely average. That tells us most traders didn’t change their mind and stuck with the cash and stock positions they started the day with. If anyone traded well today, it was surely more luck than skill. These violent swings convinced reactive traders to buy and sell at the exact worst moment. The only way to survive chop like this is to resist the urge to trade. That means sticking with the positions you have, or watching from the safety of cash. Reacting to a choppy market is the surest way to blow up a trading account. 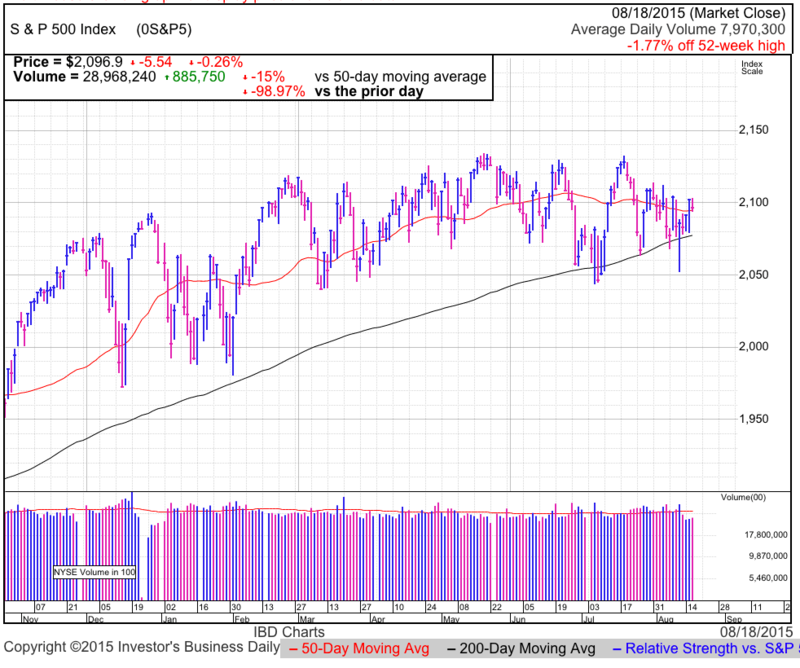 This morning’s mindless selling pushed us under the 200dma. The best the financial press could come up with was blaming Chinese stocks, which paradoxically ended the day up 1.2%. Don’t bother trying to understand the logic on that one. By lunchtime the market found a bottom and started rallying 30-point ahead of the Fed’s meeting minutes. But the euphoria was short-lived as we gave up a big chunk of the rebound by the close. While we love to assign blame for every move, the simple truth is people were selling because other people were selling. The herd rushes in and the herd rushes out. These daily moves are nothing but head fakes that convince reactive traders to give away all their money, and so far they’ve worked exceptionally well. I don’t see anything in Wednesday’s trade that suggests this is the start of something worse. The market chopped around all summer and this looks to be much of the same. We had multiple opportunities to breakdown this year and there isn’t anything here that makes these headlines more credible than the ones the market ignored previously. Contrary to the crowd, I’m eagerly looking forward Fed’s rate hike in September. Without a doubt this will kick off the next rally leg when they announce a 0.25% hike followed by similar hikes every three-months. That gives us clarity and predictability as well as two more years of historically low interest rates. The Fed laid out a similar plan with Taper and paradoxically the end of Quantitative Easing lead to a 10% rally in equities. We will see the same thing here because it will finally let us stop worrying about when the first rate hike will happen. 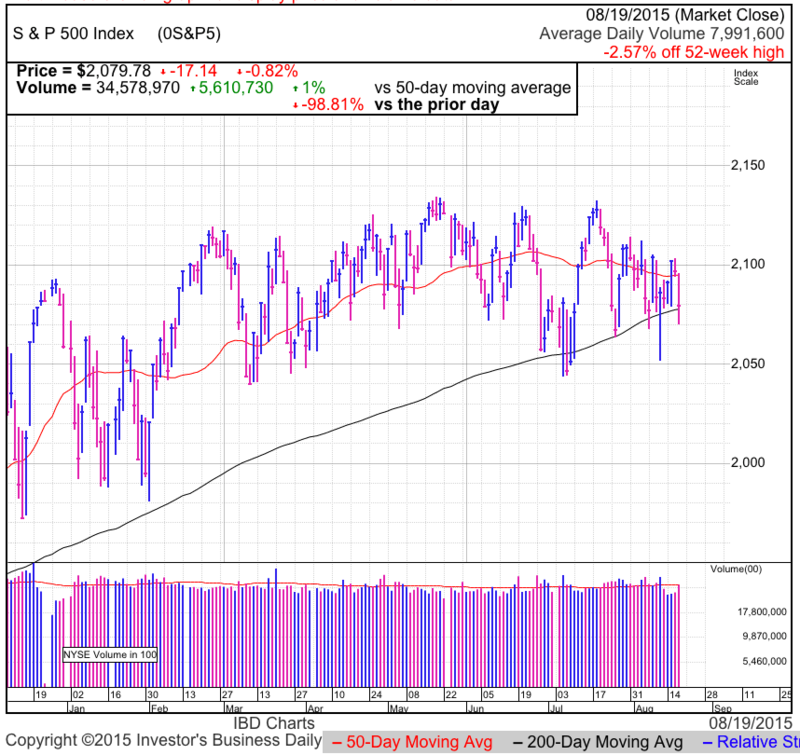 Tuesday the S&P500 slipped back under 2,100 support/resistance in an otherwise quiet and uneventful day. 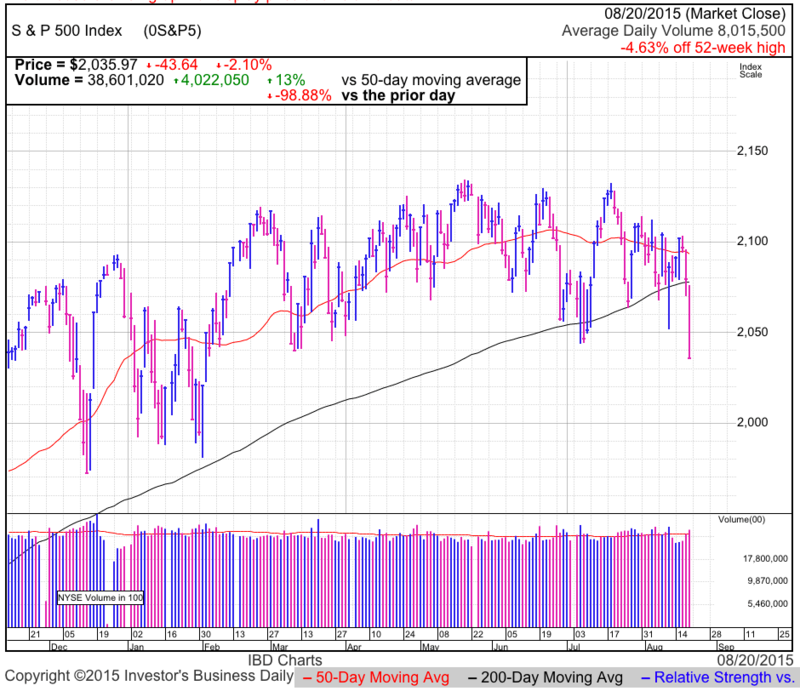 Trade resembled a typical, slow summer session, a welcome departure from last week’s dramatic swings. The most noteworthy thing is how modest the loss was considering the Chinese stock market plunged 6% overnight. That easily could have triggered another emotional rout if this rebound was fragile or unsustainable. The fact our market yawned at those developments tells us anyone who fears China is already out of the market and current owners are not interested in selling that story again. Right or wrong, when no one sells a headline, it stops mattering. Prices move on supply and demand, not headlines or fundamentals. Successful traders take their cues from what matters and ignore what doesn’t. We find ourselves within a couple percent of all-time highs for the umpteenth time this year as we extend the longest and tightest trading range in 65-years. There are two ways to interpret this range-bound market. The half-full analyst says if were going to breakdown, it would have happened already. The half-empty outlook counters with if we were ready to go higher, it would have happened by now. Both opinions are valid, but only one is right. The question is which one. Depending on the way a technician looks at the data, it is just as easy to come up with a bullish interpretation of our situation as a bearish one. That means we need additional information to figure out what comes next. The tiebreaker is sentiment. 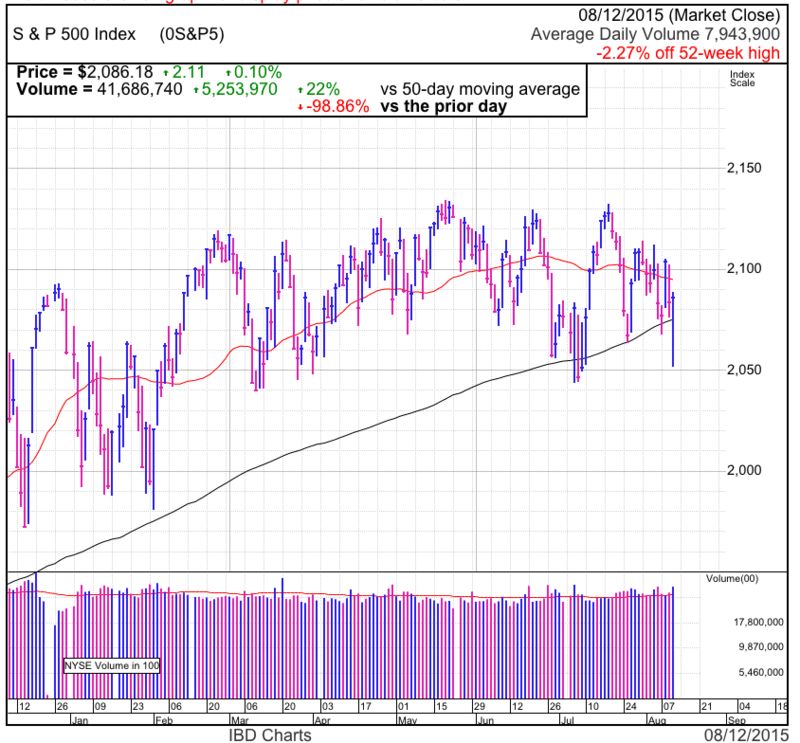 The mood and outlook of the market tells us if this is stalling or pausing. For various reasons that we can cover in another article, the market will move in the opposite direction of the market’s mood. If we are flat while everyone is excited about the future, that means we are running out of new buyers and stalling. On the other hand, if the sideways trade happens under dark clouds and widespread pessimism, then we are pausing and refreshing before the next leg higher. This is standard and widely accepted contrarian theory. To figure out what comes next, all we need to do is look at what the crowd thinks and take the opposite side. Over the last few months headlines have been dominated by Grexit, strong dollar, plunging energy sector, Chinese stock market bubbles, rate hikes, lowered revenue and earnings forecasts, anemic domestic growth, stagnant wages, and a host of other ominous stories. Given this backdrop, it’s little wonder most sentiment measures are in the toilet. But as contrarians, all the negativity tells us this sideways trade is a refreshing bullish consolidation and it is clearing the way for the next leg higher. Taking it one step further, these bearish headlines also assure us this is one of the safest times to own stocks. While most will disagree with me, if all the above bearish stories failed to break this market, it is hard to imagine something that will dent it. Limited downside and healthy upside create a very favorable risk/reward, making this a great time to own stocks. By the time it feels safe, it will be too late. 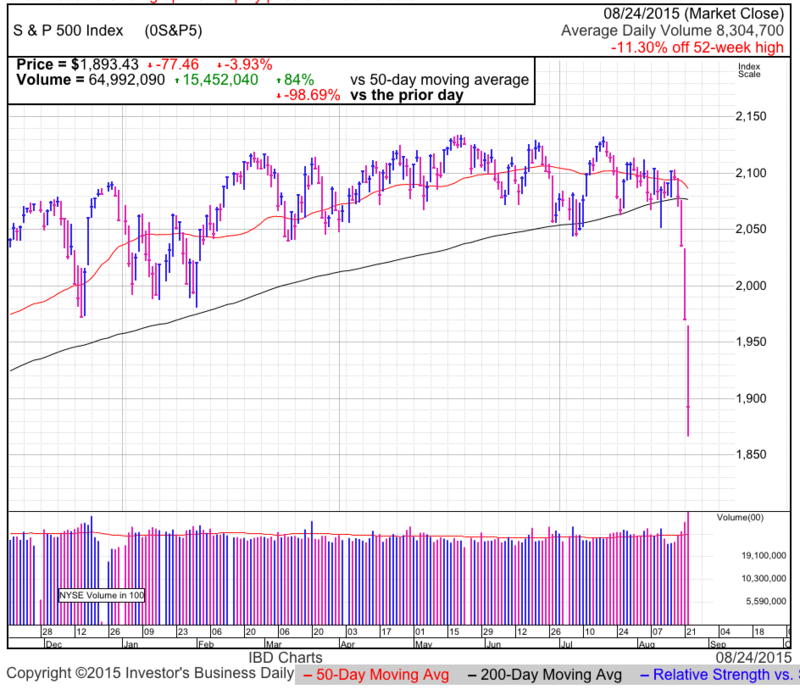 On Thursday the S&P500 ended down a modest 0.1% following Wednesday’s gigantic reversal. Thursday started weak, but we quickly found support at 2,080, effectively extinguishing the emotional trade that dominated Wednesday. 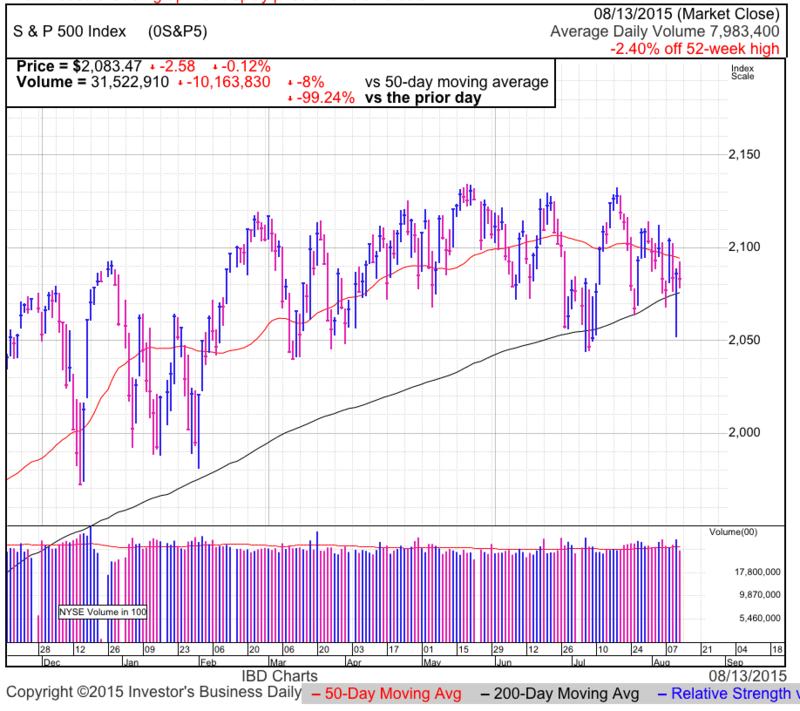 If the market was vulnerable to a collapse, sellers would have piled on this morning’s weakness and the downward spiral of emotional selling would have resumed. Instead, supply dried up and we traded sideways the rest of the day. It’s cliché to say “don’t fight the tape”, but fighting this market has practically become a national pastime. Sentiment remains in the toilet by almost every measure. Stocktwits $SPY sentiment had bears outnumbering bulls by 2-to-1. The historically bullish AAII sentiment survey also shows bears beating bulls by a healthy margin. Identical trends are evident in put/call ratios and short interest. And anecdotally it is hard to get away from the bearish hecklers in my blog’s comments and Twitter feed. Everyone loves hating on this “overvalued” market, yet here we stand less than three-percent from all-time highs. When the crowd and the market don’t agree, my money is always on the market. This was a day traders won’t soon forget. Contagious overseas selling dragged the S&P500 down nearly 1.5% before lunchtime. By itself this was a striking move, but the day was only half over and the second act was even more impressive as we rebounded to close in the green! We’ve grown accustomed to daily moves that measure a quarter of percent in this dull and slow market. We haven’t even moved outside a 5% range all year-long, but somehow we managed to slide across 3% in one day! Amazing. Unfortunately for many traders this wasn’t the good kind of amazing because it convinced them to trade reactively, a.k.a. sell-low and buy-high. And honestly I cannot fault anyone who was fooled by these dramatic moves. Sometimes the market gets the better of us and this was easily one of those days. After this move made both bulls and bears look foolish, we are left wondering what comes next. Clearly the selling could have spiraled out of control because nothing shatters confidence like screens filled with red. But supply dried up near 2,050 support and we bounced. This rewarded those that held the dip and Pavlov would tell us they are even less likely to sell the next one. This was yet another example of a market that simply refuses to breakdown. While the obvious interpretation of today’s bullish reversal is, well bullish, nothing in the market is ever that clear-cut. A breakout above all-time highs is extremely likely given this market’s refusal to breakdown, but emotion is sky-high and chances are this will be anything but a smooth ride. While confident owners are keeping supply tight, it will take a bit of time before recent sellers warm back up to this market. Whether is it lingering fear, or a refusal to admit making a mistake, many of these sellers will stay in cash until prices climb so high they stop fearing a correction and start fearing being left behind. Often we see prices snap back aggressively from extreme oversold levels, but it is hard to claim a 2.5% dip from all-time highs qualifies as extremely oversold. Today’s rebound tells us the path of least resistance is higher, but it will probably continue to be a bumpy ride.